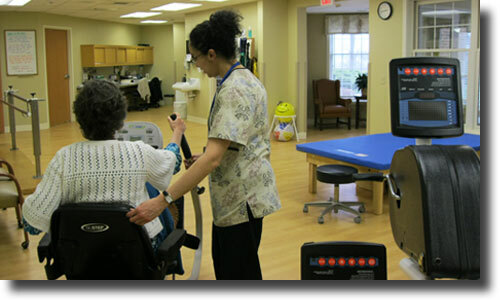 Our skilled rehabilitation team is available to individuals who are living in their own homes, whether in our Fairmount community or the surrounding community. We offer Physical, Occupational, Respiratory and Speech Therapy at both our Wheat Ridge and Crest View fully-equipped therapy gyms, enabling residents to gain strength and regain skills. Our professional team of therapists will work with you and your physician to develop a rehabilitation plan that best meets your needs and your goals. The Community Rehab Center at Wheat Ridge, pictured above, features a fully equipped therapy gym with new equipment. It is designed with a separate outside entrance directly into the therapy area for outpatient use. A Rehab Center is located also on the first floor of the Crest View apartment building. Here the full range of therapy services are available for residents without having to leave the building. Rehab admissions are through an application and evaluation process. Please call our admissions office for more details.